For more than 30 years, projects of co-management of Community goods and lands aiming at reinforcing participatory and self managed development and involving various types of actors have strongly increased and they achieved contrasted results. In some emblematic cases, for example in Latin America, various forestry communities of Central or South Mexico, or in Guatemalan Petén area or in some Panamanian or Columbian indigenous territories have succeeded in building self managed organizations. They progressively overcame the roadblocks and developed either self-managed funds based on their own economic benefits from forestry activities or new institutional arrangements based on public or private investments. After several years the organizations and groups developed instruments and mechanisms and they became a major player in the management of forestry resources in their territories. However various questions remain pending: How far could they influence or even change the power relationships in the concerned territories? Did they obtain social and economic transformations bringing collective benefits? Which are the main obstacles to overcome in order to achieve an overall improvement of welfare in in the region? Trying to answer those questions opens to us new ways to understand the roadblocks, contradictions and conflicts that exist at various levels in the management of community lands and goods. While they have managed to progress by building progressively roads toward co-management of forestry resources, we need to understand if this co-management still remains dependent on of the State approach and bodies or if it succeeds in generating new arrangements that can lead to transformations in the territory control of the region. While we can clearly see successful experiences of concertation and co-management in forestry, experiments of co-management in agricultural production remain scarce/limited because they imply types of regional and financial processes as well as types of actors that do not easily fit into regional co-management. To stick to Ferguson  terms, the development machinery sometimes only consists in bringing solutions on the sole technical aspects, ignoring the ethical and political dimensions of an effective territorial co-management. To facilitate long-term collective well being the institutional arrangements generated by this self-managed development need to generate political transformations that are able to change the power structures. 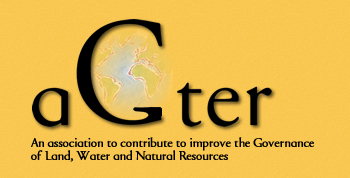 This release of the AGTER newsletter displays thoughts and examples that enable us to assess the needed transformations and the various ways of building long term sustainable solutions. Please note that the synthesis of the 13 workshops of the WFAL world meeting are now available in English on the WFAL website ! suivi d’un débat avec Emmanuel Monteil de Terre de Liens et Bernard Vincent, arboriculteur bio en Seine-et-Marne. à l’Amphithéâtre Tisserand, AgroParisTech (rue Claude Bernard, Paris 5ème). Le pastoralisme, un mode de vie résilient face à de nombreux défis. Note C2A #25. Mardi 14 mars : rencontre avec Pierre Bitoun autour de l’ouvrage "Le sacrifice des paysans ; une catastrophe sociale et anthropologique"
Las sintesis de los 13 talleres del FMAT estan disponibles ! Synthesis of WFAL workshops are now available ! Agriculture, création de richesse et emploi. Systèmes herbagers économes. Nadège Garambois, Denis Gaboriau. Synthèse vidéo de la Réunion thématique d’AGTER du 8/12/2016.